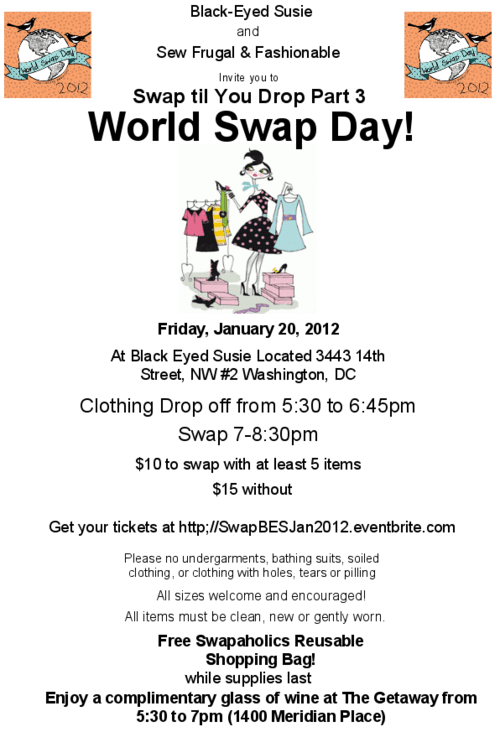 @BlckEyedSusieDC and @SewFrugal 2012 Jan and Upcoming April Clothing Swap!! 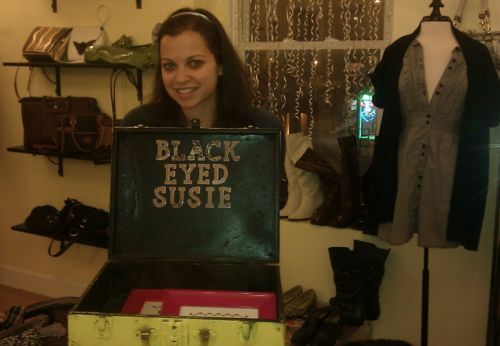 The swap was a mix of the items that everyone had brought and the items in the store that Susie chose to donate. It is a great way to clear out some of the older merchandise for the new stuff to come in. After chatting with the other ladies waiting for the swap, it was finally time to go over. It was a blast, the only flaw of this swap is the store size!! I had a few claustrophobia attacks after getting stuck in the corner while trying to navigate through. Once I found my rhythm though, it was time to score some great finds!! One of the keys with a swap is patience; you have to make multiple rounds because you will often find new things with each round. Maybe something you didn’t notice the first time or something someone was previously holding. Another swapping key is HOLD TIGHT TO WHAT YOU FIND!!! Don’t let the pretty polished outfits fool you… these girls will pounce on an outfit down! A couple of girls inquired about items I was holding and were keeping an eye out for me to put stuff down. I had to sacrifice a pair of jeans to make it through!! Despite that, I was able to get out of there feeling like I’d made a fair trade for all of my items as you can see from the photo! After the swap, I stuck around to help Susie clean up and put the shop back in order. Once everyone left, Susie packed up the left over items that didn’t go (and I scored a few more pairs of jeans!) and then we packed it up to go for donation. Once that was completed, we went back over to the Getaway to have a breather over a drink. Overall it was a wonderful evening where I met some great ladies, got some great new clothes and I am very excited for the next one coming up April 29, 2012 at 2pm. More info to follow! !